Whether you have played video games in any age or haven’t ever picked up a game console, there is a strong possibility that you may have heard about esports. The word esports stands for ‘electronic sports.’ It is basically a type of computer or console game that is played by an individual or team of players against other individuals, or teams over the internet. Unlike a team of football players who play the game together, eSports players compete against each other with computer games. But it does not take place inside homes between friends and family. Huge esports tournaments take place all over the world in big stadiums with large crowds. Around the year 2000, when computers became cheaper and the internet faster, more and more people started getting involved with computer gaming. It also became easier to connect with other gamers around the world, so they could play against each other. Players have now become so skilled, as well as gained millions of fans, that computer gaming has become organized, competitive and professional. There are many games available nowadays that facilitate multiple players playing online from around the world. Esports stand out as different from these games, as these events attract major sponsorship from various companies. They also have an organized tournament structure. As a result, these events also tend to attract the best gamers across the world. Many are amateur players, but an increasing number especially in South Korea and China are professional gamers who earn their living playing in esports tournaments. As an online medium, the popularity of esports has grown immensely in recent years, not just with players but with viewers also. Many follow the events in major tournaments. Esports are much popular in Europe. In fact many countries have taken advantage on the popularity by broadcasting eSports on major sports channels. Currently there are 3 major eSports operators: Turtle Entertainment, Major League Gaming, and Dreamhack. Major League Gaming has the largest platform – hosting 10 million users as of 2016, Turtle Entertainment hosts 6 million users and Dreamhack organizes the world’s largest online festival. Also in the same year it was announced that eSports would be getting an official organization, called the World eSports Association, something like what Fifa does for football. 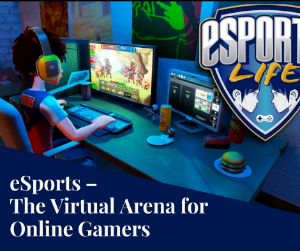 Some of the commonly played esport games include – StarCraft 2, League of Legends, Hearthstone, Counter Strike: Global Offensive, Heroes of the Storm, Defense of the Ancients 2 (Dota 2) and the list goes on. Traditional sports clubs, like Premier League football teams, have started buying eSports players to represent them in competitions. Sean Allen, a professional esports player was signed up by the English Premier League Club in May. He was a runner-up in the 2016 Fifa Interactive World Cup, the video game version of the game. Although the eSports industry is not new, it has only recently started gaining attraction. ESports has become a lucrative industry in recent years, generating hundreds of millions of dollars in profit. This popularity has allowed it to function much like other professional sports leagues. The number of eSports viewers reached to 143 million in 2017, which is predicted to reach 250 million in 2021. In the recent years the increasing availability of online streaming media platforms, particularly YouTube, Twitch.tv, Smashcast.tv has led to the growth and promotion of eSports competitions. There is no doubt that eSports are on the rise. Could it be bigger than football or cricket one day? Only time will tell.